A few years ago, while watching an Oprah segment she opened up about her “life lesson” at age 7, an “ah-ha” moment! 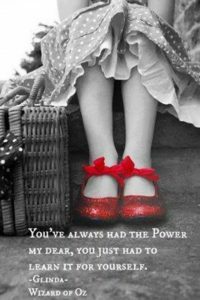 This was an “ah-ha” moment for me too, realizing the true power of “Oz.” And this is why I am pursuing this blog. I want to hear your own stories. [During a conversation with thought leader Jean Houston about the life lessons everyone can learn from The Wizard of Oz, Oprah opens up about how Glinda’s simple words — “You’ve always had the power” — have never left her.